An evening of performances from Japanese singer, songwriter, and musician Miho Hatori (NYC vocalist of the NYC group Cibo Matto and Gorillaz), the collaborative hyperscape sensory duo MSHR, and the dense noise composer and projectionist Doron Sadja. This event is a collaboration between Clocktower, Pioneer Works, and the seminal media and architecture group LST. Clocktower has also created an audio guide for the exhibition, The Present is the Form of All Life: The Time Capsules of Ant Farm and LST featuring archival content and contemporary interviews with artists Chip Lord, Curtis Schreier, and Bruce Tomb. The audio guide can be found here: sound-capsule.org. Miho Hatori is a Japanese singer, songwriter, and musician. She is primarily known as the vocalist of the New York City group Cibo Matto. She is also known for her work with virtual band Gorillaz. MSHR is a collaborative project by Birch Cooper and Brenna Murphy. The duo builds and explores systems as a way of manifesting ecstatic sensory zones. They work at the intersection of digital sculpture, analog hardware and ceremonial performance. Their current performance series revolves around a unique system of light-audio feedback that employs their hand made synthesizers. The duo insert themselves into the system, shifting sculptural sensors to steer the feedback patterns as they explore the hyperscapes of a transhumanist ceremony. MSHR emerged from the 5 person art collective Oregon Painting Society in 2011. Doron Sadja is an American artist, composer, and curator whose work explores modes of perception and the experience of sound, light, and space. Often working with multichannel spatialized sound, smoke machines, and high intensity lights, Sadja combines pristine electronics with lush romantic synthesizers, dense noise, and immersive light projections to create hyper-emotive sonic architecture. 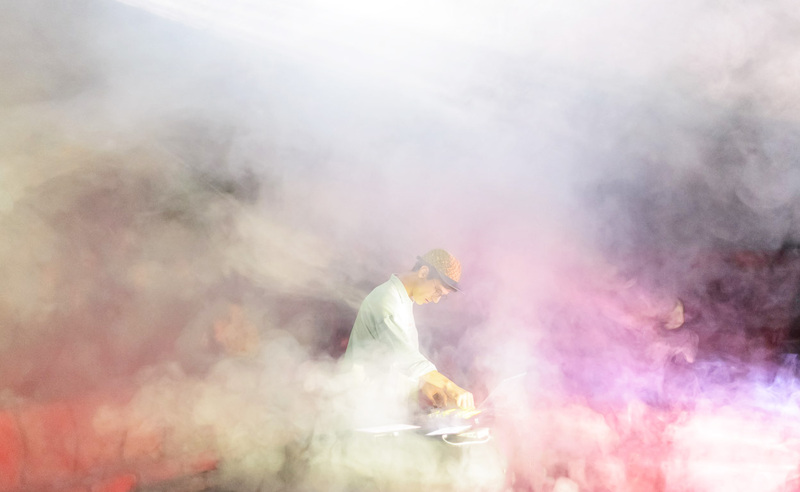 Although each of Sadja’s works are striking in their singular and focused approach, his output is diverse: spanning everything from 25 speaker sound works to stroboscopic smoke and light shows, 360 degree projection pieces, and custom built motorized speaker systems that can precisely track sound around a room. Sadja founded Shinkoyo Records and the West Nile performance space in Brooklyn (RIP), and currently runs the Sound Portraits lecture/listening series in Berlin.